Our aim is to bring genuinely tight institutional level pricing direct to the retail FX trader through a richly informative, elegantly designed platform. MahiFX, the new proprietary-built foreign exchange (FX) trading platform, has officially launched to retail Forex traders worldwide. The platform, developed by ex-interbank traders, analysts and developers, is headed by David Cooney, former global co-head of currency options and e-FX trading at Barclays Capital and Susan Cooney, former head of electronic FX institutional sales in Europe for Barclays Capital. 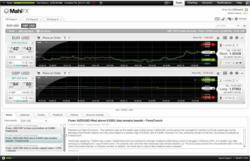 Details of MahiFX spreads in all time zones can be viewed here on the spreads page together with historical data. The MahiFX platform trading requires no minimum deposit. To view an introductory video detailing MahiFX platform attributes and functionality please follow this link. MahiFX’s core offering to the retail market is based on transparency, technology, pricing and design. MahiFX is headquartered in New Zealand, with offices in London. The Company is regulated by The Australian Securities and Investments Commission (ASIC), Australia’s corporate, markets and financial services regulator. Headquartered in Christchurch, New Zealand and with offices in London, MahiFX launched its proprietary-built browser-based foreign exchange (Forex) trading platform on the 20th February 2012. Developed by a team of ex-interbank traders, analysts and developers, MahiFX provides retail forex traders with an unrivalled trading environment and experience through its provision of a technologically-advanced trading platform and competitive market maker rates.